Over the years we have shared ASCAP's news articles on the most performed Christmas songs of the year, and even decade, because Gene Autry's recordings of Christmas songs usually makes the list. 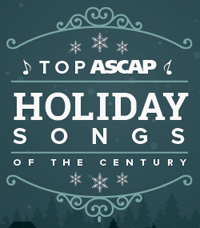 In honor of ASCAP's 100th anniversary, their top holiday list for 2014 focuses on the songs and the songwriters, not the performer. And we are pleased to know that Gene Autry – as a songwriter – has made the list of Top 30 ASCAP Holiday Songs of All Time with "Here Comes Santa Claus (Right Down Santa Claus Lane)." We also wish to congratulation songwriter Johnny Marks, who wrote "Rudolph the Red-Nosed Reindeer," for having three songs on this list. New York, NY, December 4, 2014 – It's become an annual tradition: at the beginning of every holiday season, the American Society of Composers, Authors and Publishers (ASCAP) announces its list of the most-performed holiday songs of the year – the evergreen hits that accompany more family get-togethers and wintertime shopping trips than any others. "Santa Claus Is Coming to Town" became an unexpected hit for songwriters Fred Coots and Haven Gillespie when radio star Eddie Cantor was looking for a holiday song to sing on a Macy's Thanksgiving Day Parade radio broadcast in 1934. Though Cantor never recorded it commercially, George Hall and the Hotel Taft Orchestra's 1934 version, with a vocal by Sonny Schuyler, charted that same year. Bing Crosby and the Andrews Sisters, Perry Como, the Four Seasons, Luis Miguel and Bruce Springsteen have recorded beloved versions of "Santa Claus Is Coming to Town" over the decades; recent covers by ASCAP members Justin Bieber (2011), Rod Stewart (2012) and Sufjan Stevens (2012) have kept it relevant to today's listeners, 80 years after it was written. While this list is stocked with songs that have warmed our hearts and homes for generations, "All I Want for Christmas Is You" deserves attention as the youngest song to crack the list. 2014 marks the 20th anniversary of Walter Afanasieff and Mariah Carey's modern Christmas classic. Carey's version holds records for the best-selling holiday ringtone of all time, and is Carey's biggest hit internationally. "People just like this positive love song. Anybody can sing it to anybody. From father to child, mother to child, wife to husband...it's universal," Afanasieff told ASCAP in a recent video interview. "It's a very simple arrangement...I guess that made it so easy for the whole world to go ‘Oh! I can't get that out of my head.’" Afanasieff has produced many covers of "All I Want for Christmas Is You" over the years, most recently a version for Idina Menzel's 2014 holiday album, Holiday Wishes. Below is the list of the top 30 most-performed ASCAP holiday songs of all time. Each song includes songwriter credits, plus the year that the song was first released, performed or published.